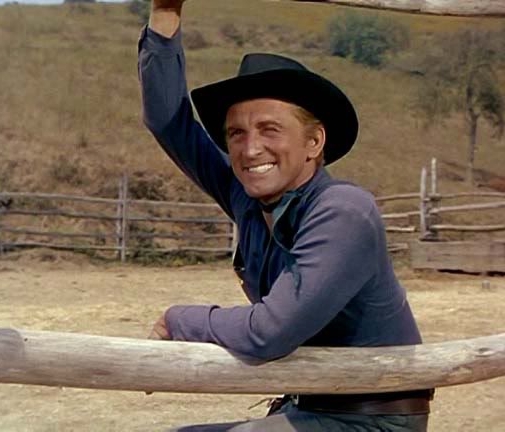 I have often heard it said that Kirk Douglas’ favorite film is Lonely Are the Brave featuring the cleft chin icon as an aging, misplaced cowboy running out of time and space. If you’ve seen that film before this one, then Man Without a Star, filmed seven years earlier could almost serve as a prequel of sorts. Again Kirk seems to be a cowpoke on the run. Not from the law or a vendetta against him. Just from civilization itself though he is somewhat excited by the newfangled ideas making there way across the west. ‘A bathroom right in the house?” This outdoor adventure tale begins with Kirk riding the rails hobo style and meeting up with a greenhorn played by William Campbell. The two get to know each other just in time to see Jack Elam knife a man on route. Kirk uses his street smarts to help Campbell avoid a hanging and turn Elam in for a bounty of fifty dollars at the next stop. 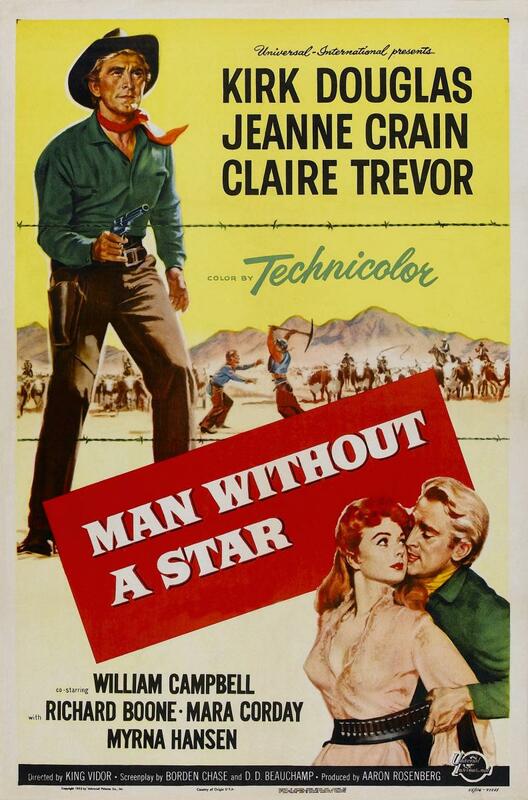 It’s in this shabby looking hole in the wall town that he’ll renew acquaintances with saloon gal Claire Trevor and along with his young charge, secure employment at a local ranch run by foreman Jay C. Flippen. 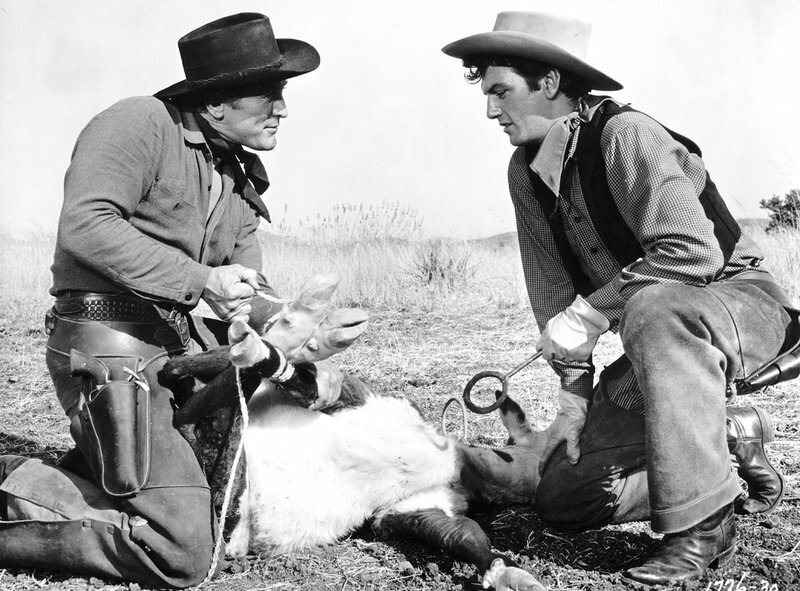 The next third of the film is fairly light hearted with Kirk and Campbell making there way around the range herding cattle and meeting the smaller outfits run by neighboring ranchers. That’s all about to change when the introduction of barb wire to the territory comes up. Douglas’ demeanor instantly changes to one of anger and fear. The small ranchers are intending to use the wire to fend off the big herds from taking all the grass on the range. When Kirk’s new ranch owner arrives with the intention of bringing more cattle into the territory, those grasslands are going to be worth fighting for. 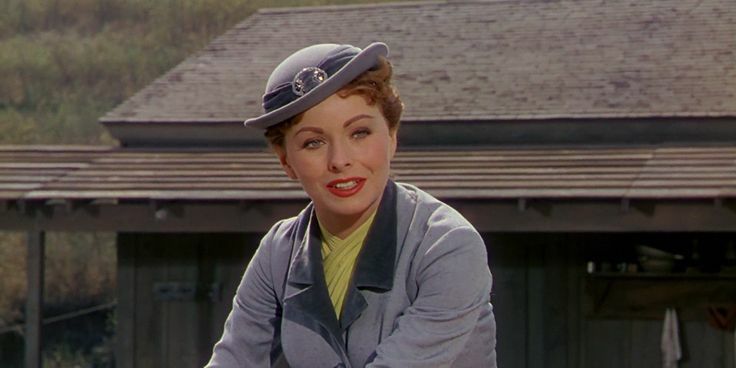 Kirk is in for a big surprise when he gets a look at the new owner, Miss Jeanne Crain. Kirk gives us a big wolfish grin when meeting Crain at the ranch. “You’re not bad with horses.” he states admiringly. Her response obviously can be taken more then one way. “I’m not bad with anything.” She’s clearly left the door ajar for our untamed cowpoke. Kirk is soon to find that he’s on the wrong side of the tracks when Crain has another 5000 head of cattle arrive. Leading the herd is Richard Boone, a man who clearly has a past history with Douglas. They verbally spar and one should clearly be able to see where this is headed. There’s a range war to come and shots to be fired before this King Vidor film comes to a satisfying conclusion. Still this is no by the numbers western via Universal International. 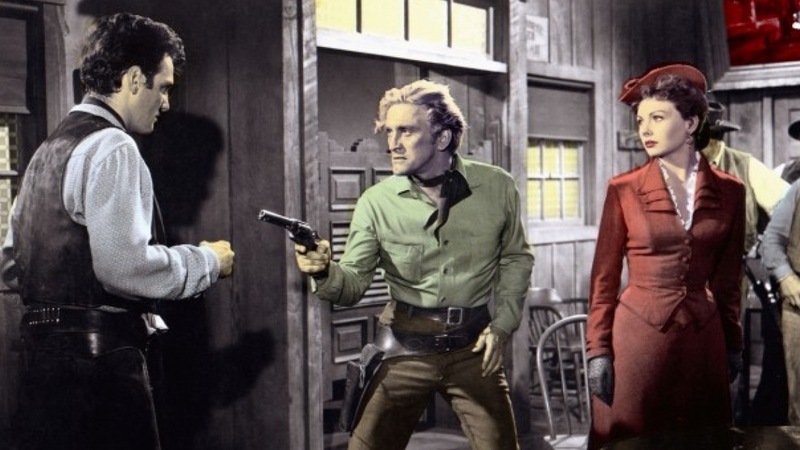 While there may be some fists thrown and shots fired, this western fare takes a decidedly comedic slant thanks to Kirk’s happy go lucky streak within his roving cowboy. He’s child like and at times is the classic fish out of water when becoming a little to civilized around Crain. For the rough side of Kirk’s personality, he’s captured on camera brilliantly in a couple of key scenes. First when he moves into the shadows at the mention of barb wire and secondly when he lets his temper get the better of him drawing down viciously on Campbell later in the film. Like his Ned Land in 20000 Leagues, Kirk plays it in a jovial sense and even strums a couple tunes on the saloon banjo in an effort to dodge a fight. Finally if you know Douglas, then you know he loved to do some of his own stunts and twirl a revolver for some fancy six shooting. It’s all in here in this entertaining role for one of the great leading men of film. In Kirk’s autobiography The Ragman’s Son, he fondly recalls being able to film his trick shooting, gun twirling sequence in one take. No cutaway to the hands of a skillful double. It’s pure Kirk. Frankie Laine sings the title tune while the superb cast also includes Sheb Wooley and Mara Corday This fifties western is one I don’t come across much but thanks to an old VHS release, I still have it around. I have a hard time getting on with this film. First time I saw it, many years ago, I though it was OK. But I viewed it again when it came out on DVD and I wasn’t all that impressed. Sure it looks wonderful and the cast is a strong one, but it’s very uneven and all over the place tonally. I wasn’t especially convinced by the direction Douglas’ character went in and the actor himself needed to rein it in a bit at certain points. Also, some of the light-hearted and outright comic material fell flat with me. I should probably watch the movie again to see how I feel now though. It does have an uneven feel to it and that’s due to Kirk’s playing it light though it did offer a more shuddering effect when he let’s his dark side surface at key points. By no means a classic but it was nice to check it out after a good 20 plus years. The climax isn’t as definitive either meaning not so many bodies lying about as was usually the case.